Make sure to click on the scores to see our all new box scores. They’re really something else. 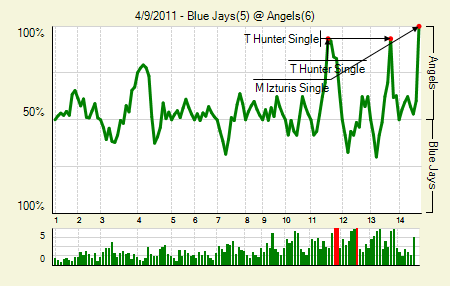 Moving the Needle: Maicer Izturis wins it with a single in the 14th, +.399 WPA. A less speedy player on second and he might have had him. A better throw, too, and they might have gotten him. But Peter Bourjos raced around third base and didn’t stop until he had scored the winning run in the 14th inning of Saturday’s game. The hit ended a scoring drought that started in the fifth inning. Yes, that’s the equivalent of a complete game with no score in this one. 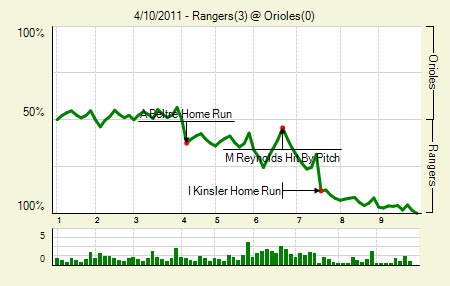 Moving the Needle: Ian Kinsler insures the rubber game victory, +.196 WPA. The Orioles and the Rangers played an odd series this weekend; Friday’s game got called for rain, and then each team won a lopsided game in Saturday doubleheader. Sunday’s game didn’t feature much scoring; through six the only run on the board was an Adrian Beltre solo homer, but in the seventh Ian Kinsler hit one to the same spot as his teammate had earlier. The hit plated two and gave the Rangers a three-run lead that, ultimately, they ended up not needing. Moving the Needle: Dustin Pedroia brings the Sox to within one with a double, +.184 WPA. The Sox might have won two of three, but their biggest WPA swing came in the one they lost. Pedroia, who had perhaps the best weekend in baseball, scorched a two-run double that plated two, turning a 5-2 deficit into a 5-4 one. 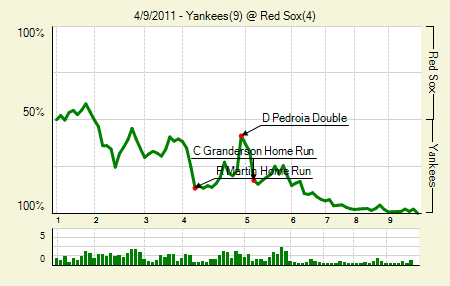 The Yankees would quickly get those two back, but for that fleeting third of an inning the Sox were back in the game. Still, the only time any of the three games felt over was when Marco Scutaro doubled in two on Sunday night. Moving the Needle: Dan Johnson turns a perpetual deficit into a lead, +.599 WPA. Heading into the ninth inning on Friday, the Rays hadn’t held a lead all season. Down three and facing Matt Thornton, it appeared they’d have to wait another day. But a pair of errors, followed by a B.J. 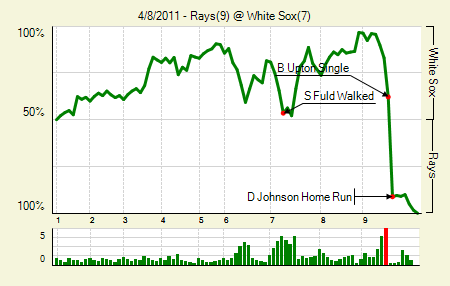 Upton single and Johnson’s homer, gave the Rays five runs in the inning and, yes, a two-run lead. They held on to keep the lead, and then got off to a 1-0 lead in the second inning on Saturday. But they lost it an inning later, and wouldn’t lead for the rest of the weekend. Moving the Needle: Victor Martinez clears the bases with a long double, +.174 WPA. 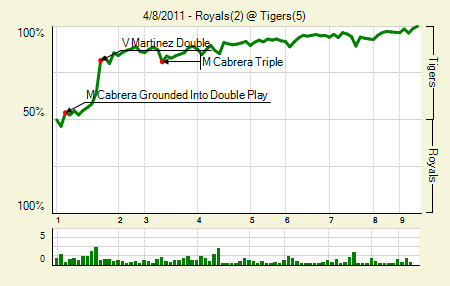 The needle didn’t move with much veracity in the Tigers-Royals series this weekend. Most of the meaningful scoring happened early, with few counter-strikes. Martinez’s long bases-loaded double — a granny in many other parks — put the Tigers up 3-0 in the first on Friday, which went a long way in their 5-2 victory. But it was the Royals who took control early on both Saturday and Sunday, taking the series. 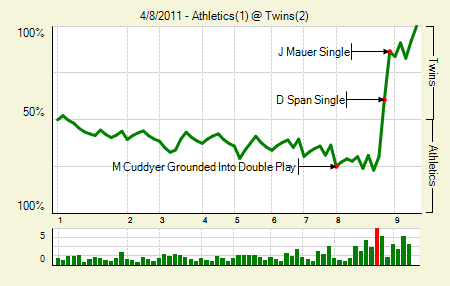 Moving the Needle: Denard Span plates the tying run and sets up Mauer, +.303 WPA. Brett Anderson and Carl Pavano went back and forth in this one, with Anderson holding a 1-0 lead most of the way. He came out in the eighth and had a one on, two outs situation, but failed to finish off the Twins. After a Jason Kubel put runners on the corners, Denard Span pulled a grounder into right to bring home the tying run. One batter later, Joe Mauer put one on the ground the other way, plating the winning run. 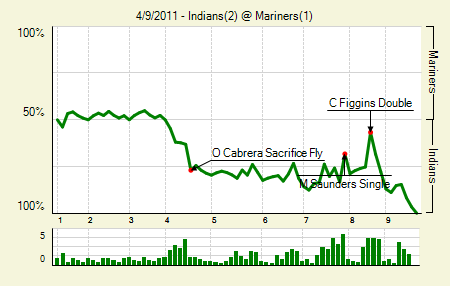 Moving the Needle: Indians fans won’t like it, but: Chone Figgins doubles, +.185 WPA. Behold the quirkiness of WPA. The Mariners did not hold a lead all weekend. Not even for a half inning. Yet not only did Figgins’s double swing the WPA more than any other play, but the double itself did not score a run. It put the Mariners in good position, as it put the tying run in scoring position with none out in the eighth. But they never brought him around to score, and the game ended with the Indians clinging to their one-run lead. After losing their first two games to Chicago, the Indians are 7-0. Moving the Needle: Chris Young finishes what Stephen Drew starts, +.373 WPA. 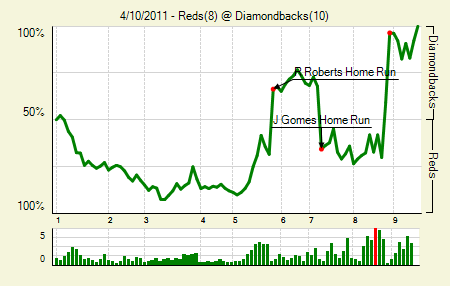 This game actually featured two needle-moving homers. Ryan Roberts, who is off to an impossibly hot start, hit one in the fifth to turn a 5-3 deficit into a 6-5 lead. Drew actually set up that one, too, hitting a bases loaded single to make it 5-2. In the eighth he tied the game at seven with a single. Young, the next batter, laid into a Nick Masset fastball and put it over the wall in left-center for the go-ahead runs. A three-run lead in the eighth usually means big things, and for Young it was the biggest hit of the series. Moving the Needle: Brian Schneider goes way long, +.253 WPA. The Braves took out Cliff Lee in the opener of this series, but they didn’t quite get things going off Roy Oswalt on Saturday. The Phillies offense made sure that it wouldn’t matter either way, piling on 10 runs in the effort. The biggest blow came in the fourth inning, when Schneider, who homered four times in 147 PA last year, took Brandon Beachy deep. Not that it took any special talent from Schneider- Beachy put the ball on a tee. The two-run shot broke a 1-1 tie, and the Phillies went on to steamroll the Braves from there, outscoring them 10-1 the rest of the weekend. Moving the Needle: Logan Morrison ties it and sets up the go-ahead runs, +.356 WPA. 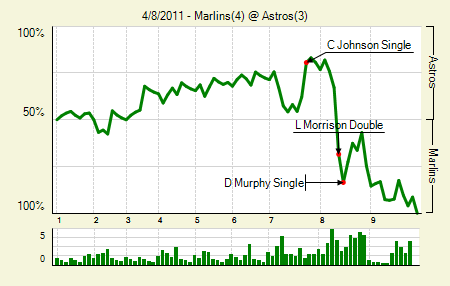 Friday night’s contest between the Marlins and the Astros was one of my favorites this weekend. That’s probably because no one thinks much of a Marlins-Astros game. But it was a quality, pitching-heavy contest that unraveled in the final few innings. The Marlins didn’t score until the seventh, and then, down 2-1 in the top of the eighth, Morrison doubled down the right field line to score Greg Dobbs, setting up second and third with one out, and Donnie Murphy came through with an infield single that brought around the go-ahead run. 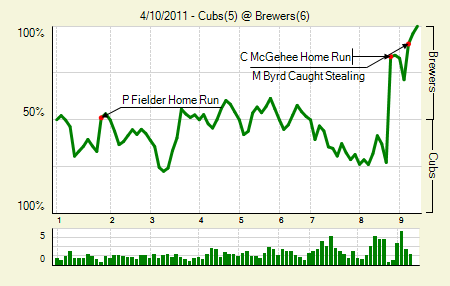 Moving the Needle: Casey McGehee turns the series in favor of Milwaukee with a two-run homer, +.566 WPA. This rubber game was a well-played match, with both teams staying even most of the way. In the end, the Brewers homers won out. Prince Fielder and Ryan Braun hit bombs earlier in the game, but it was McGehee’s homer in the eighth that put the Brewers on top for good. Kerry Wood’s fastball caught a little too much of the plate, and McGehee took it the opposite way for a go-ahead two-run blast. John Axford had everyone in Milwaukee holding their breath after he allowed a single to lead off the ninth, but a caught stealing, a strike out, and a fly out later, and the Brewers emerged victorious. Moving the Needle: Ivan Rodriguez breaks the tie in the 11th, +.320 WPA. Laynce Nix really struck the fatal blow here when he followed Pudge’s go-ahead RBI with a three-run homer, making the score 7-3. But before Nix piled it on, Pudge did give them the lead with a sharp grounder that got past a diving Daniel Murphy. 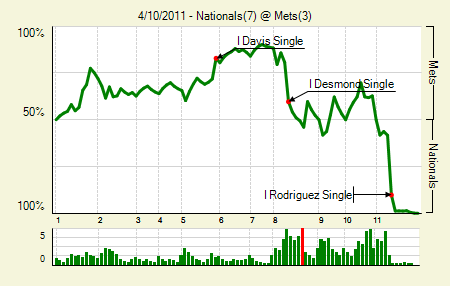 Rodriguez also started the comeback in the eighth, when he doubled to lead off the inning while the Nats trailed 3-1. 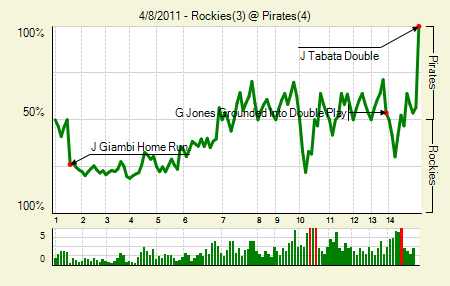 Moving the Needle: Jose Tabata walks off with a double, +.434 WPA. The Pirates and Rockies went into the early morning hours for Friday Night’s game, holding a 3-3 tie from the sixth into the 14th. The Pirates had a runner on first and two outs, with Tabata at the plate and pitcher Garret Olson on deck. Eric has an excellent take on Hurdle’s gambit, which might have been the difference in this one. Instead of walking Tabata to get to the pitcher, the Pirates pitched to him, and he answered with what was nearly his second homer of the night. 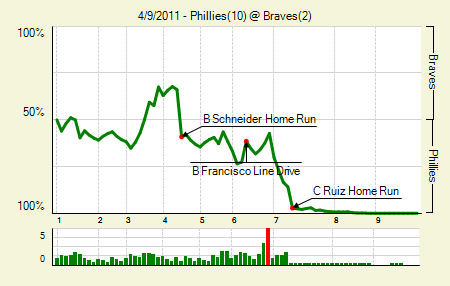 Instead it bounced off the top of the wall, but it was easily enough to send the Pirates home winners. This might have been the best series of the weekend, if you’ll believe it. 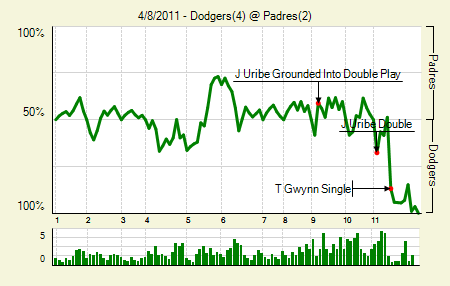 Moving the Needle: Tony Gwynn finally brings home the go-ahead run, +.382 WPA. Rain was the story in Friday night’s game. It delayed the start of the game, and then caused two hour-plus delays during it. Finally, after a nearly half-hour delay after 1 a.m., the umps called this one and had them finish it the next day, which is when Gwynn hit his go-ahead single, though Will Venable probably should have caught it. A wild pitch gave the Dodgers at two-run lead that they’d hold through the bottom half. Honorable mention goes to Cameron Maybin, who destroyed a few baseballs yesterday to help the Padres avoid the sweep. Moving the Needle: Miguel Tejada walks off with a double, +.843 WPA. The Giants and the Cardinals played a wild set this weekend. Friday night’s game featured two ninth-inning comebacks. 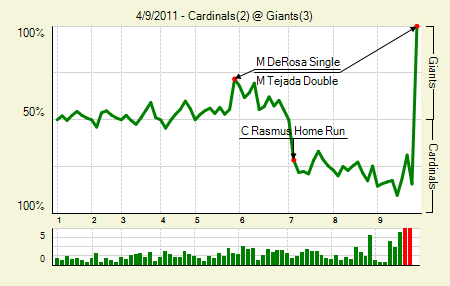 First Ryan Theriot turned a 3-2 deficit into a 4-3 lead with a two-run single. Pablo Sandoval answered the next inning with a two-out, RBI single to put the game into extras. Aaron Rowand eventually won it with a bases-loaded single. The next night, on which the Giants received their World Series rings, it appeared they had lost. The Cardinals held a 2-1 lead heading into the ninth, but couldn’t hold on. We hoped you liked reading The Morning After: Recaps for the Weekend of April 8th by Joe Pawlikowski! No mention of the incorrect runner interference call that cost the Blue Jays the game? The Jays won the game in the 13th, and then lost it in the 14th. Exactly. What’s Bob Davidson’s WPA? Hard to believe that a guy who doesn’t come within 5 feet of the fielder and doesn’t even change direction or speed still gets called out for fielder interference. If was the fielder who chose to avoid Escobar and wait for the ball. I would be interested in the WPA swing of this call. I will give it a try, but would like someone to confirm or correct. The play resulted in a -.138 WPA for the Blue Jays. The Blue Jays WE before the play was 51.4%. I am using Paul Konerko’s at bat during the 9th inning of the game against the Royals on Wednesday, April 6, 2011. I am assuming the 9th inning and 13th inning produce the same WE since both could be the last inning of the game. The result of Konerko’s at bat was a WE of 82.6%. So without a interference call the play would have resulted in a +.312 WPA. So I believe the call was worth -.450 WPA for the Blue Jays. Is there an easier way to do this? Is there a tool that allows you to create situations and see the resulting WPA? Would be interested in the impact of other controversial calls.